Editor’s Note: Below is the press release announcing our first call for contestants, on April 2nd, 2015. We thought it would be worth reposting here as it helps provide where we think yardfarming could bring us in the turbulent future just over the horizon. Washington, DC: After 14 incredible seasons, Yardfarmers—the award-winning reality TV show that inspired a national change in how we grow and eat food, and ultimately how we live—is finally coming to an end. “I remember when it all started, back in April of 2015,” said show creator Erik Assadourian, “when we launched our very first call for contestants to find six young Americans willing to move back in with their parents to convert their parents’ and other neighborhood lawns into yardfarms.” Back then, more than two-thirds of American adults were overweight or obese, most ate diets full of highly processed foods made primarily from corn, wheat, and soy, and at the same time many Americans spent thousands of dollars a year sustaining polluting, climate-changing, monocropped lawns. In fact, as hard as this is to believe now, in 2015 the fifth largest crop in the United States by acreage was the turf-grass lawn. But today, after 14 seasons, most former lawn space is now devoted to producing food for the household and surrounding community. And of the 4.3 million acres of lawn that still exist—down from roughly 40 million acres in 2015 (See Figure)—most are in the form of community parks and athletic fields, both of which also serve as grazing land commons. 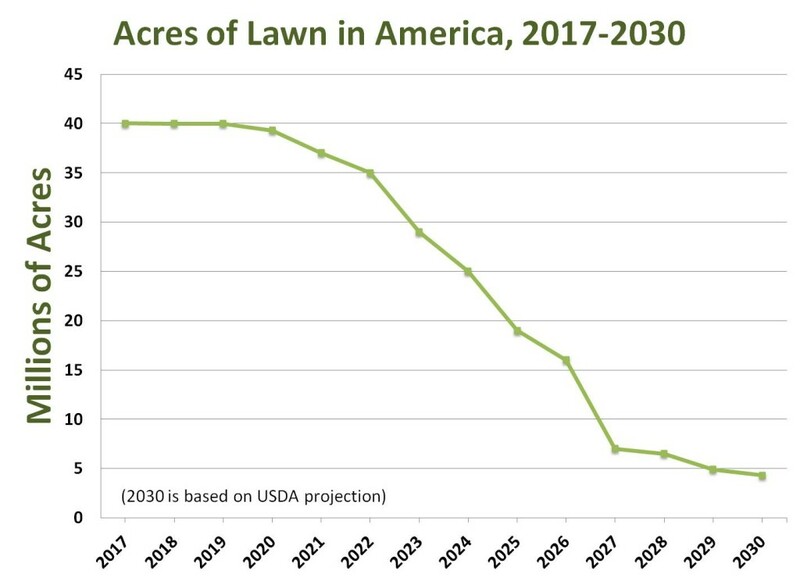 This transformation of America’s lawns into yardfarms (“yardfarm” officially entered the Oxford English Dictionary after Season 5 in 2021) played a significant role in increasing local food production to the current one-third of daily food needs, in bringing America’s overweight/obesity rates down to the current 18 percent, and in reducing the climate emissions of the agricultural sector by nearly 40 percent. Experts also point to the show as what prevented America from being seriously affected by the global famine of 2026, when massive droughts simultaneously hit the bread baskets of the Midwest, Western Europe, and Russia. 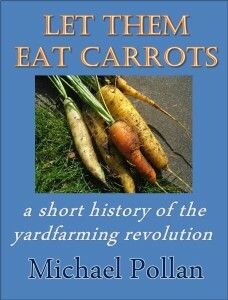 “As most American communities produced at least part of their daily food needs, they became more resilient in the face of more unpredictable climate patterns,” wrote food scholar Michael Pollan in his best-selling history of the yardfarming revolution, Let Them Eat Carrots (Island Press, 2028). Of course, none of this would have happened without the success of the first season that aired in 2017. And the call for contestants that launched on April 2nd, 2015 is when it all started. At that time 36 percent of young Americans (ages 18-31) were living in their parents’ homes. But back then, living with mom and dad was typically a source of shame. Yardfarmers succeeded in tapping into the changing social realities and converting that shame into the pride of living healthy, interdependent, community-connected, sustainable lifestyles. As the original call for contestants noted, “The conversion of a million acres of lawns to yardfarms begins with one seed sown.” Fourteen seasons and 36 million acres later, that conversion has now run its course. This press release officially announces the call for contestants for the upcoming reality TV show, Yardfarmers (airing 2017 with filming in 2015 and 2016). Yardfarmers is a production of Big Mouth Productions in partnership with the Worldwatch Institute. More information about the show can be found at yardfarmers.us and more about the call for contestants, including official rules, at yardfarmers.us/call-for-contestants. For more information or to interview show creator Erik Assadourian or director Katy Chevigny of Big Mouth Productions, please call 1-202-271-3758 or email press@yardfarmers.us.